Pumpkin Gogi Granola Cookies | What Smells So Good? I promise, this is the last pumpkin recipe of the week - but it's a good one! 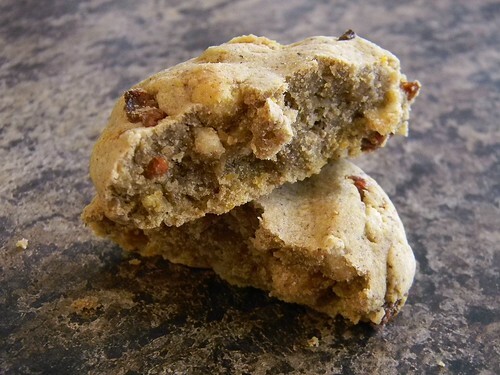 Not only are these cookies gluten free and vegan, but they are SO full of pumpkin flavour! The secret? Concentrating the pumpkin - a fantastic tip that I picked up from the original creator of these unleavened bites, Tessa. While she cooked hers down on the stovetop, I didn't have a small enough pot so baked it down instead. The cookies themselves are extremely dense, obviously, but not dry or "sawdusty" like some storebought GF products can be, and they have a great texture from the chewy gogi berries and crunchy cereal I added. While I wouldn't call these chewy cookies, they're not crisp, sandy or cakey really. Just toothsome, super spicy and delicious! These also travel well - which helped around the holidays - and the dough freezes beautifully too so you can bake it off as needed. That said, these really are at their best when completely cool, and leave them on the sheet for that otherwise you will have Pumpkin Gogi Granola crumbles! Preheat oven to 350F and line two baking sheets with parchment or silicone. Place the pumpkin in a small baking dish. Bake, stirring occasionally, for 15-20 minutes, until it’s reduced to ½ cup. Set aside to cool. Leave oven on. Cream the coconut oil and the sugars in a mixer until creamy. Beat in vanilla and pumpkin. Add the flours, cornstarch, guar gum, pie spice and salt and beat until well blended. Stir in the cereal and gogi berries to make a rather stiff and dry feeling dough. Place golf-ball size balls of dough on the sheet and press the tops down slightly. Bake for 12 minutes, until turning just golden around the edges. Cool completely on the sheet. Beef Stroganoff for #SundaySupper's Birthday!